Each year from January to March, Melbourne Zoo and Sydney’s Taronga Zoo host a series of twilight music concerts featuring local and international headline acts to raise money for conservation efforts. 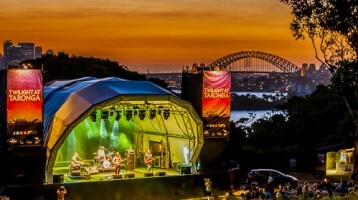 For it’s 20th anniversary, Sydney’s Twilight at Taronga series will feature huge Australian artists Bernard Fanning, Sarah Blasko, You Am I, Dan Sultan, Something For Kate, and Paul Kelly as well as free public transport for ticket holders, including a 15 minute ferry ride from Circular Quay. Other performances include Bjorn Again, James Morrison Big Band, and Australian icons Mental as Anything. Twilight at Taronga runs every Friday and Saturday night from 30th January – 21 March. All profits will support the Taronga Conservation Society Australia. Melbourne Zoo will feature a range of music and artists, from rock n’ roll, indie, and folk, through to disco, blues, reggae, Afro-funk, Bollywood and more. Headline acts include Spiderbait, The Village People, Bernard Fanning, Sarah Blasko, James Reyne, Dan Sultan, Paul Kelly and The Cat Empire. Zoo Twilights runs every Friday and Saturday night from 30th January – 7 March. All profits will help save the Eastern Barred Bandicoot, now considered extinct in the wild.